I have been perusing through the financial news and scouring for hints of what the outlook over the next few years is shaping up to look like for our mortgage rates. 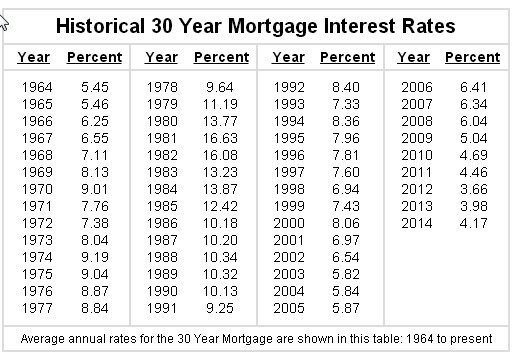 The trend in thought has been that these historic low rates were primed for a rise. But many professionals are backing off the dire short term conclusion that rates will spike and taking a more status-quo view, at least through the end of 2016 and into portions of 2017. Of course this all lies under the presumption that significant economic events do not alter the financial markets. A disruptive war, major shift in national and or world politics, etc. Ah, the future it is just so gray and fuzzy isn’t it? This is why I have been harping on the notion that people take advantage of the current low rates and mild rising market to get a home before it is priced out of reach and while the rates are so favorable. 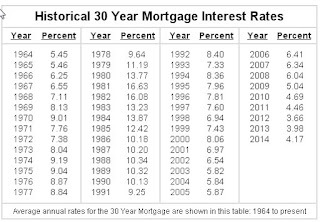 Historically rates have been as high as 17% and as low as they are now. Here is a chart from forecast-chart.com. Showing average annual rates since 1964. Looking at the chart one can quickly see that this is a great time to take out a mortgage! Understand that these figures represent the average rate issued by banks over the course of each year on the chart. Actual rates move around regularly and may be adjusted up or down based on the individual loan and the borrower’s credentials. There are still some financial gurus that feel the government may be pressured into moving away form the strong loan guarantees they have been making since the crash in 2009. The presidential election next year could determine the path rates will take over the next few years. They really have nowhere to go but up as we are very near the historic low. Odds favor an increase over a decrease and even if there is a decrease it could go much lower than it already has. Conditions support a positive purchase decision. Since the future is always cloudy one should consider the conditions today which are still quite favorable for buyers.